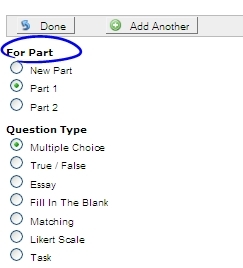 When you add questions o an assessment, you can also choose in which part to put them in at the same time. You don’t have to use this feature if you don’t want to group your assessment questions into parts. It is a choice and a feature that allows you to group your questions into parts as you author or select them (i.e. by topic, chapter, difficulty, objective versus essay questions, etc.). You can keep clicking on Add, Select, Draw, or Add Another, without changing the “For Part” selection. By default all of your questions will be added to “Part 1” (created and selected for you). You may return later, prior to publishing your assessment, to group your questions into parts. In some of your assessments, you may have only one part, while in others, you may want to add several parts. As you will find, one part can be used for a complex assessment, calling questions from all your pools! You can randomly draw questions from pools, or select questions manually, one at a time, to add to your assessments. The assessment can include questions from many pools. You can have many parts on your assessment, and each part can contain questions from any number of pools. If you like to group your assessments into parts, AT&S offers you a view where you can order parts, title them, or even remove them. 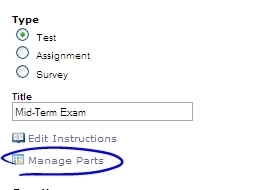 To access the “Manage Parts” view, click on its link just below your assessment title. Under Manage Parts, you can see how many points each part is worth and how many questions it has. Additionally, you can you can add or edit titles for your parts. You may also leave part titles blank. If you do so, they will be simply listed as Part 1, Part 2, etc. in delivery / student view. Under Manage Parts, you may also delete parts. Please keep in mind that if you delete a part, the part AND its questions will be removed from your assessment! This is not a ‘deep’ delete, however. The questions still exist in your question pools and you can select them again and add them back to your assessment, if you deleted a part in error. Also, under Manage Parts, you can set the order of your parts (see drop-down numeric menus in the “Order” column). As always, click on Done or Save at the bottom to accept your changes. Finally, this view offers the ability to shuffle the components of your parts. More about shuffling and question ordering in the next tutorial. 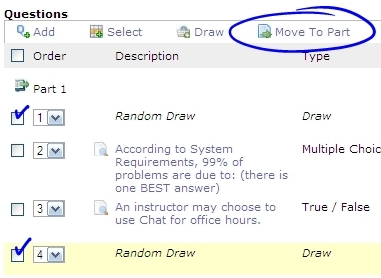 You may check individual questions and / or draws and choose to move them into another part. It could be that you designed an assessment without thinking in terms of ‘parts’ but later wish to group the questions into distinct parts by topic, chapter, difficulty, objective versus essays, etc. Just check the questions or draws and click on “Move to Part”. Choose the part to move them into and complete the process.